This symbol was used by sappers in the British Army when they mapped Ireland for the Ordnance Survey in the 1830s. 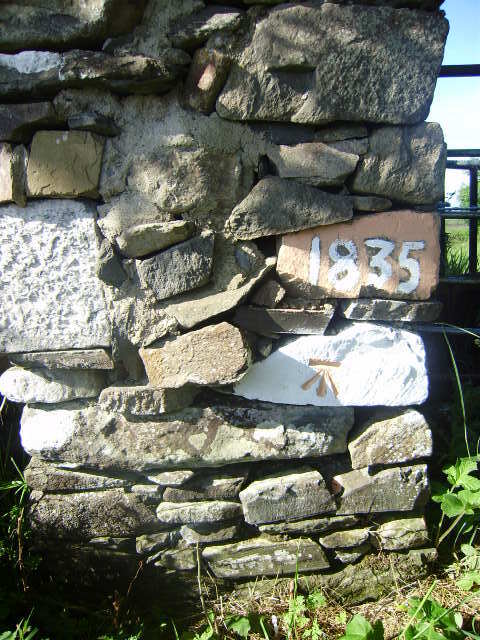 The gatepost is on my land opposite my house which means that the gatepost is almost 200 years old. I rebuilt the gatepost which was almost demolished when I located it. The crow’s foot is marked on the OS maps and shows this height was around 300 feet above sea level. 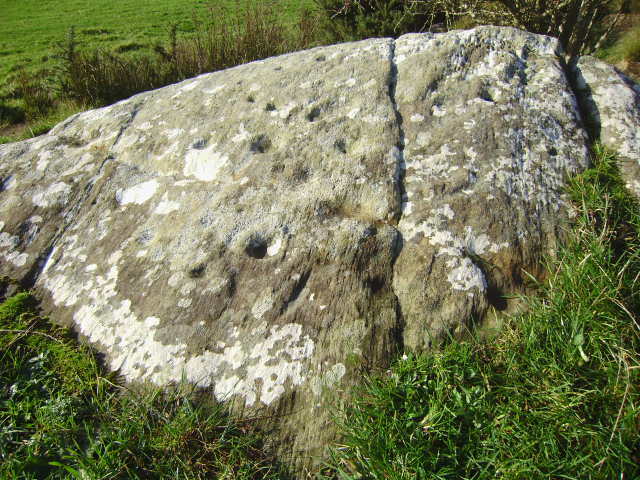 Such marks were made every couple of hundred yards but few still survive. You can see one at Drumnagessan Bridge on the Ballyharry side. Even old gateposts have their own secret history. Stop and look at the next gatepost you meet when walking in the countryside. Local people got good wages when they were working with the sappers. The soldiers enjoyed the work as there was a lull in warfare after the defeat of Napoleon at Waterloo. I commissioned Tim Stampton, Ballagh Studios, Malin to make this wood engraving based in the collection of engravings in John Derricke’s The Image of Ireland (Blackstaff Press) first engraved in 1581. The traditional image of the Irish as a nation living on potatoes and porridge is far fetched. 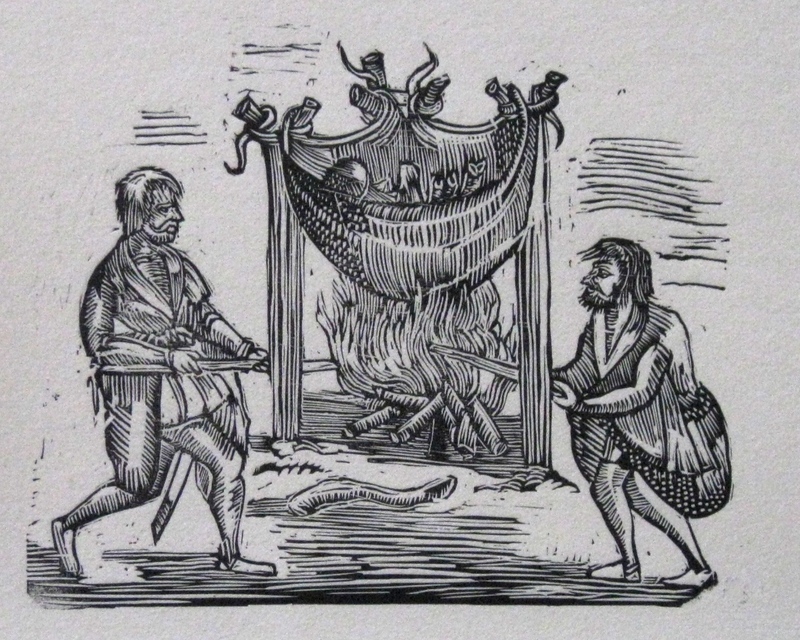 In this engraving, two part-time cooks prepare a feast for a chieftain and the menu is an exotic one. You can see other aspects of the feast in the Blackstaff edition. Tim describes the original engraving as the work of highly skilled craftsmen. the meat is cooked in a huge carcase. Beats the microwave for my money. Yes we did have a Great Famine but at other times our ancestors enjoyed many a good take away. Interested in thr image at top of your blog – is it the Mevagh Cross? Sean, great blog and a fantastic way of finding out more about Inishowen. I love the sapper’s symbol, a great find!